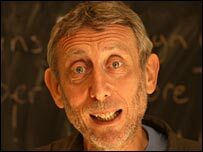 Children's Laureate Michael Rosen has said government literacy policy is having a "disastrous" effect on poetry. He spoke out after an Ofsted report said poetry was taught well in two-thirds of schools but there was room for improvement. Inspectors in England found most pupils liked poetry but had only a limited knowledge of classic poems. Schools often concentrated on preparing children for exams at the expense of teaching poetry, the report said. The report found poetry teaching in primary and secondary schools was at least satisfactory in all 86 primary and secondary schools visited. However, the quality of poetry teaching varied greatly and remained "under-developed" in many schools. This was reflected in the limited range of poems studied and pupils' limited experience of classic poems and poems from other cultures and traditions. "Although these poems were mostly worth studying, many of them were relatively lightweight and pupils had only limited experience of classic poems and poems from other cultures and traditions," said inspectors. Provision was slightly better in primary schools than in secondary schools. But many primary teachers did not know enough about poetry and focused on a narrow range of relatively easy works by modern writers, the report found. Children's experience of poetry suffered, inspectors said, through the "emphasis over recent years on raising standards of basic literacy" and national tests. "Poetry featured less in the English curriculum in Years 6 and 9 in the schools visited because too many teachers focused on preparing pupils for the tests," said inspectors. The Children's Laureate has condemned the effect of the government's emphasis on exam results. Mr Rosen told the BBC News website: "The effect of Sats and indeed the whole literacy strategy, have to my mind, been disastrous for poetry. "Poetry is either sidelined or subjected to pointless questioning on the supposed 'facts' of a poem and children spend their time counting metaphors and proving that this or that makes a poem effective. "Effective for who? The children aren't asked. I welcome the fact that this report goes some of the way to exposing what's going on." The laureate - who wrote the best-selling children's book "We're going on a bear hunt" - is not alone in criticising government policy. The National Association for the Teaching of English (Nate) says teachers are under too much pressure to get children through exams. Nate director Ian McNeilly said: "For a teacher under pressure to deliver results there may be precious little time or inclination to study areas which are not for assessment. "It's depressing that some schools might not be encouraging things like the study of poetry, reading for pleasure and engaging with texts just for fun. "All education and learning stems from pleasure and the assessment system is choking the fun out of the creative aspects of the teaching of English." In secondary school, poetry education did not provide a "coherent" preparation for studying English at A-level, the report claimed. Teachers also failed to give teenagers the chance to write their own poetry during the GCSE years. The report said: "Once pupils have embarked on their GCSE course, most teachers feel that there is too little time in a crowded examination timetable for what they perceive as a luxury." The government has admitted it wants to do more to encourage children to enjoy poetry. Schools Minister Andrew Adonis said: "Poetry is an essential part of the teaching of English literature and it is embedded in the national curriculum at all key stages. "It's vital it is taught in an engaging way. Understanding the mechanics of language and being able to express yourself creatively and concisely are really important skills. "As we made clear when we reviewed the secondary curriculum this year, teachers should embrace but not be confined to the classics. "There is a myth that poetry is obscure - which teachers can explode by introducing pupils to a broad range of poets, from different eras, styles and cultures. "I want to see a generation of young people who know their poetry from Auden to Zephaniah and their sonnets from sestinas."